Ever since my good friend Mandy Alting told me about Zanskar, many years ago, it was very high on my list. In fact, it was one of the main reasons why I came to Ladakh in the first place. Unlike most other valleys in this part of the world, Zanskar gets completely cut off from the outside world due to snowfall in the high passes up to 6 months out of the year. The only way to reach it, in summer time, is to travel over 250 kilometers on a non-paved, very rough road. And once you’ve managed that - you’ll have to leave Zanskar over those same 250 kilometers all the way back. Oh dear. The result is that not many people make it all the way up there, and village life remains very untouched. This will all change in the near future, when the connecting road to Manali is finished, and you will be able to reach Zanskar from the south side. Some say the road will be finished this year, but most likely it will take another year or two. For the poor locals in the area, the new road is great news and it will bring more visitors and business to the area. For me as a traveller, I am so glad I came now - before the rest of the world discovers the beauty of Zanskar. Starting from Kargil which is -for now- the only way in and out of Zanskar, the first 60 kilometers of road will lead you into Suru valley. The villages here are muslim villages which are dotted among wide green valleys and surrounded by snow-capped mountains. When that paved road ends - the fun starts. For me on a motorbike that is; if you are sitting in a jeep, or worse, a bus, brace yourself for an endless bumpy road. 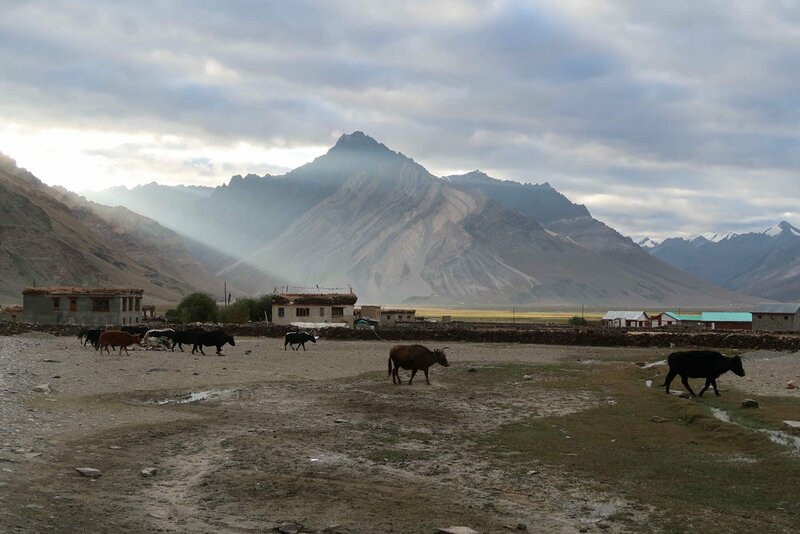 It takes around 4 hours to travel the 120 kilometers of tough road to reach Rangdum - a very small settlement with one guesthouse and a monastery. To keep things still fun and save my poor back, I decided to cut the journey in half and spend the night here. The morning light which shines over this part of the valley was just magical - and seemed a good omen for the rest of the hard journey. For the first 60 kilometers of that second day, there is not a single village so you will find yourself driving for almost 3 hours in complete wilderness with nobody but you. I was mainly hoping my motorbike wouldn’t break down and I would get stuck somewhere hoping for any help to come. Surprisingly perhaps, but my Royal Enfield Himalayan stayed royal and loyal and didn’t let me down. Passing mountains with snaking glaciers, fields full of yak and the occasional river crossing, the scenery was magnificent and the road horrible. The last 10 kilometers towards Padum (the ‘capital’ of Zanskar) was newly paved which was a very pleasant change for my sore body. This stretch of some 100 kilometers of road took again 5 hours, but because I left early, I decided to continue to Cha - deeper into Zankar valley. Supposedly only 40 kilometers, I figured it would take me another 2 hours of driving. The road after Padum made the way until there seem like an absolute breeze. The tiny, narrow road, hugging the mountains was an absolute disaster. It shifted between full on, sharp rocks, thick layers of loose Sahara-like sand, to steep-steep-steep inclines and steep-steep-steep drops - usually over a combination of loose boulders and slippery sand. My bike was bumping and flying all over the place and it took all of my willpower and strength to not launch it off the edge. Close to the village of Itchar I made one fatal mistake. There was a split in the road and no sign as which road to take - and I chose wrong. The dirt road snaked up onto a hill with incredibly steep hairpin curves, with loose sand and large rocks in the corners. On one of the left corners, I lost my speed in the sand and the bike fell to its left. Luckily, I managed to get it back up again and get back into the saddle. OK - I can DO this. But then the next curve was even steeper and my little 411 cc bike couldn’t handle the incline, and there it went again. But this time, the bike fell to the right, face down. There was no way I could lift it back up again alone, so I had no choice but to take my helmet off and go and sit next to the bike. And wait. After some time a jeep approached me - full of monks. As soon as they saw me, they jumped out of the car and came running to me. Besides myself, it took another 3 monks to get the bike back up again. “This is the road to Cha right?” - I asked. I dropped the bike twice. On the wrong road! I would have completely regretted this poor decision to head towards Cha, but even after this, I simply couldn’t. I felt like Zanskar only truly began after Padum. Until Padum, it was beautiful - yes. But afterwards, it became breathtaking. Narrow gorges with an emerald-blue Zanskar river raging below, and villages perched in between the mountains with green barley fields surrounding them. I couldn’t get enough of it. This love for the surroundings pulled me through a violent sand storm that I drove straight through, horizontal rains, bumpy, bumpy roads and a whole lot of dust. My final test of endurance came just before I reached the village Cha, where I was planning to stay the night. An excavator cut open the entire road and the road workers told me it would be at least another two days before I could pass. I had no choice but to turn around, drive 3 bumpy kilometers back, park the bike, and walk up again. With all my luggage - 2 backpacks, helmet, motorbike spare parts and repair tools. By that time, one of my leather boots that I’d bought in Manali had taken a hard blow and it had completely fallen apart. I’d ‘fixed’ it with a strap three times around the boot to keep the bottom of the boot attached - but completely covered in dust, sweaty, tired, with broken boots and looking like a packhorse I entered Cha. The locals where eyeing me and my rough appearance a little bit suspiciously at first, but then a man came walking towards me. He took half of the luggage I was carrying and started walking towards the village. I was too tired to argue, so I just followed him. He brought me to his house, warmed up some water on the stove so I could wash myself and made me some hot chai. 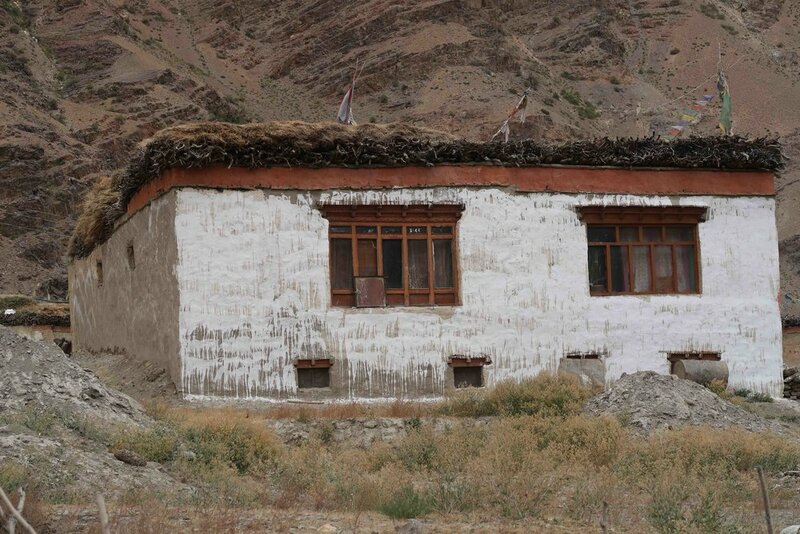 So I spend the night in a traditional Ladakhi home. 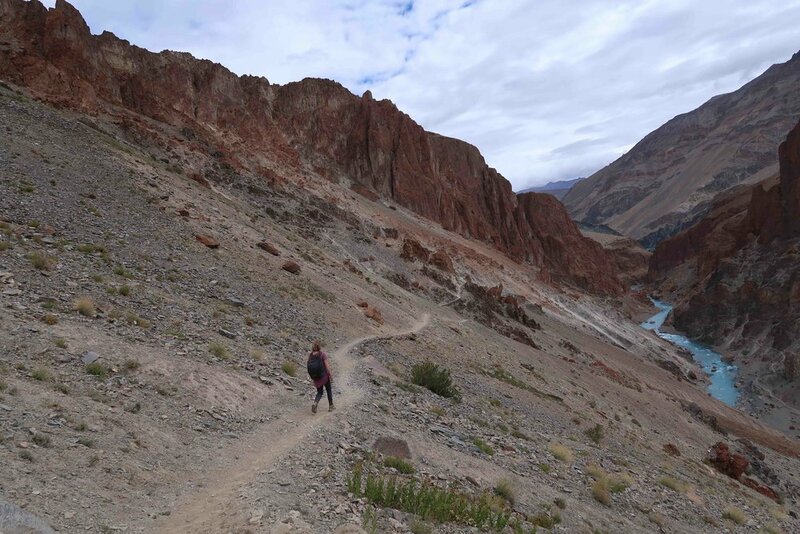 The next morning I took my daypack and continued my journey on foot, since the road really ended here in Zanskar. I hiked past a side river of Zanskar river to Phuktal Monastery. The water was of such a deep blue colour that it almost seemed unnatural. After some hours of walking, I reached Phuktal Monastery - partly set in a cave and spilling out below with small buildings to house the monks. The setting of that monastery was just magical and it didn’t take long before one of the monks approached me. After an entire photoshoot and several cups of hot chai, I made my way back to Cha and set off on my motorbike back over that god-awful road to Padum. Then my next challenge arose: fuel. Padum is the only place in Zanskar valley which has a petrol station - without a motorised pump though so they employed a guy who is manually pumping the fuel in your vehicle by turning a gigantic wheel. It is notorious for running out of fuel, which, when I was in desperate need of some, happened to be the case. When the petrol station runs out, more fuel is ordered but since that truck has to come from Leh, it easily takes 4 or 5 days before it finally gets to Padum. I had no interest in hanging around Padum for so long, so I spend hours in search of fuel. In a small shop I met the local Botany teacher (I did not expect that) - a young, glassed and energetic man who took me on a tour through Padum, visiting all his friends, students and family in search of petrol. The staff of the guesthouse I was staying at were also very helpful in my quest, and 1,5 day later we managed to scramble together 3,5 litres of petrol; coming from 3 different generators, a car and a secret petrol stash. Adding this to the little fuel I had left in my tank, we said our goodbyes and all hoped that it would be enough to make the long journey back to Kargil. 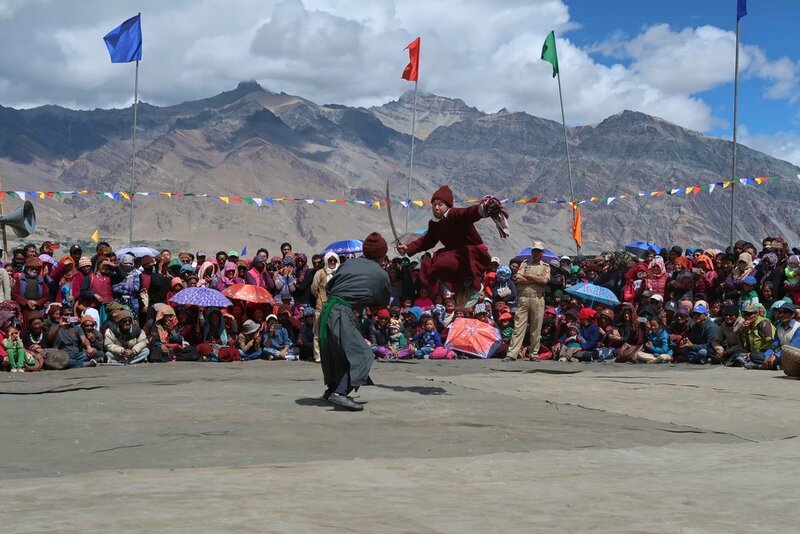 The next morning I was planning to leave early, but it happened to be Zanskar Festival - so I decided to stay the morning and watch the traditional dancing, singing, sword fighting and yak performances. 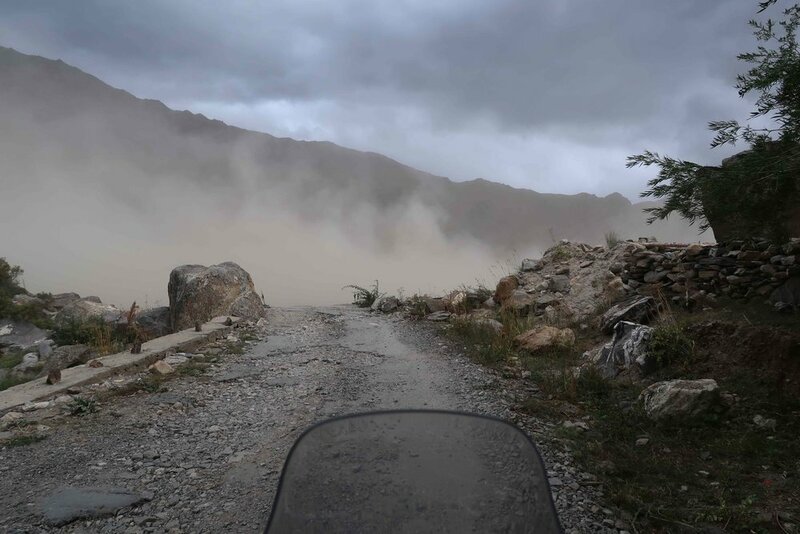 Around noon I left Padum, but was unpleasantly surprised by two road blocks, which forced me to ride 25 kilometers extra via another dirt road. All I could think of was the precious additional fuel this was costing me. Luckily, I met a villager who promised me to look for fuel in the tiny village and he succeeded! An hour later he managed to arrange 4 liters for me - plenty to reach Kargil. He invited me into his house and many cups of hot chai and fresh apples later I left him, his lovely wife and twin boys of 7 years old. The next day I rode to Kargil, where I bought new boots (one size too large but hey - it’ll do), treated my loyal bike with 3 litres of brand-new engine oil and bought a new watch since the one I had unfortunately broke in one of the motorbike-dropping-events. Ready for the next 200 kilometers to Srinagar, Kashmir! The houses in Ladakh mostly come in a white colour, with wooden framed windows and depending on how much money the owner has to spend - decorated with beautiful wood carvings. The hallways and stairs are barren from the inside and you’ll have to wear your shoes not to get freezing feet. Sometimes the walls are decorated with paint or children’s drawings, but usually you’ll find nothing on the walls. 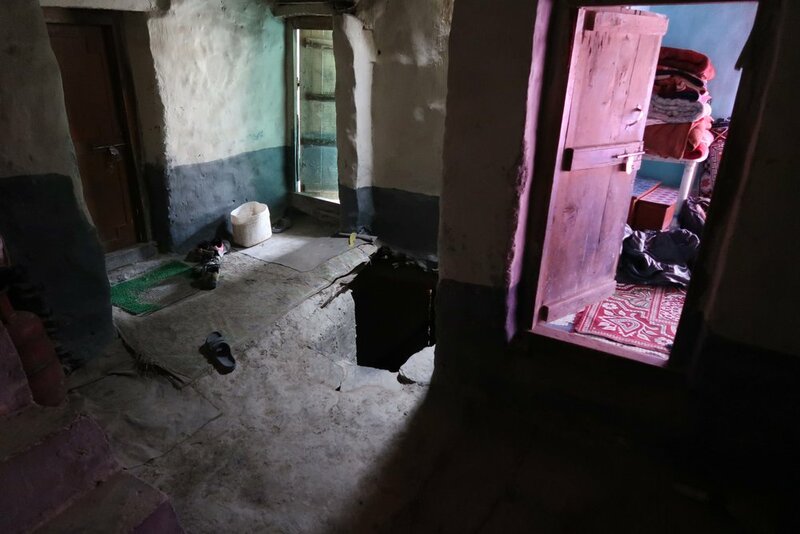 The living room and kitchen are my favourite places of the Ladakhi house: colourful, warm and cozy because of the beautiful carpets and cushions on the floor and the (often) skilful carved low-tables to eat on. So this is where you take your shoes off - just outside the living room. They don’t have such things as tables and chairs - you’ll sit cross-legged on floor cushions. The ceilings are always decorated with colourful cloth - or in this house, simple green mesh. The kitchen is the star of the room. It will consist of one, or sometimes two cabinets with a double gas stove on it, and an open shelf construction where all the pots and pans are displayed - carefully arranged by type, colour and purpose. Most of the cooking is done on the gas-stove, but there is always a stove with runs on cow- or yakdung and which is used to heat up water for bathing and to keep the kettle on. Outside the house or on the roof is where the people dry the dung before it can be used as burning fuel. 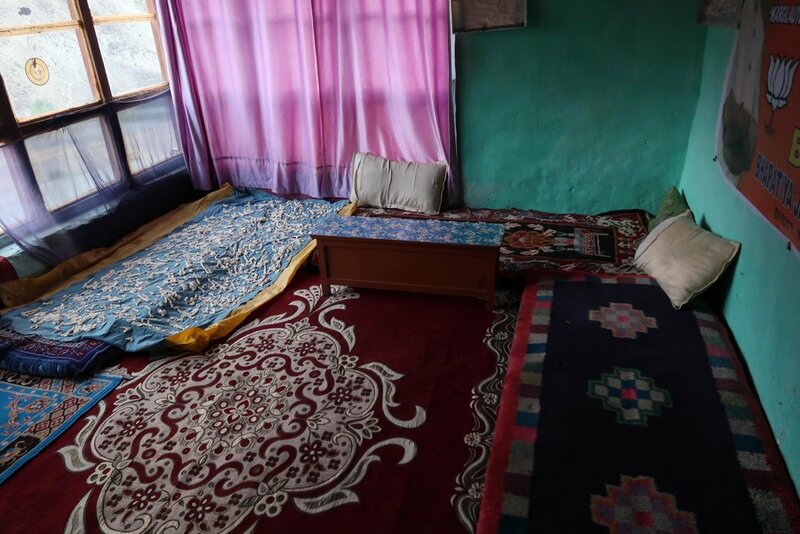 The bedroom consists of several thin floor mattresses and blankets and its where the entire family sleeps together. In my case, I had the honour to take the floor mattress right next to a blanket with drying yak-cheese. II woke up with a vile, sour, taste in my mouth. It’s great for midnight snacking though. Especially when the snoring of the head of the family keeps you awake. For hours. 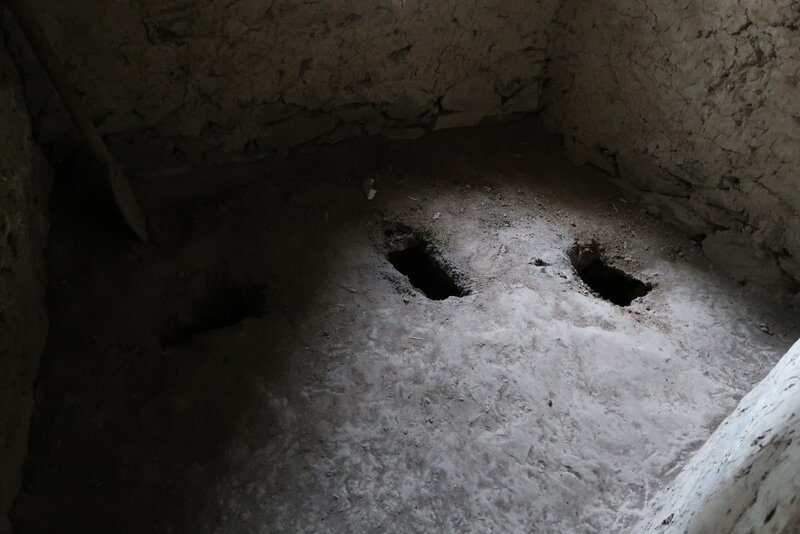 The ‘toilet’ is on the second floor, and consists of two or three holes. Whatever you drop in there can be easily accessed from the ground floor. Superhandy. Nothing there to hold toilet paper or to hold on to if your squatting skills are not strongly developed so I have to admit I was wiggling and swinging trying to balance myself and aim for the hole. I’m such an amateur! In these villages there is electricity between 19:00 and 22:00 and sometimes 23:00 hours, so that is the only time the lights work and you can charge your phone or camera (if they have sockets - which is not always the case). The best thing about Ladakhi villages and homes are the people though - they make it warm and welcoming and will try everything to make you feel at ease. Neighbours and relatives tend to drop in all the time for cups of chai and servings of chapatti, so by staying in one home, you’ll get to see most of the villagers anyway. Hallway with access to living room, bathing room and bedroom. The toilet - pick one of the holes!